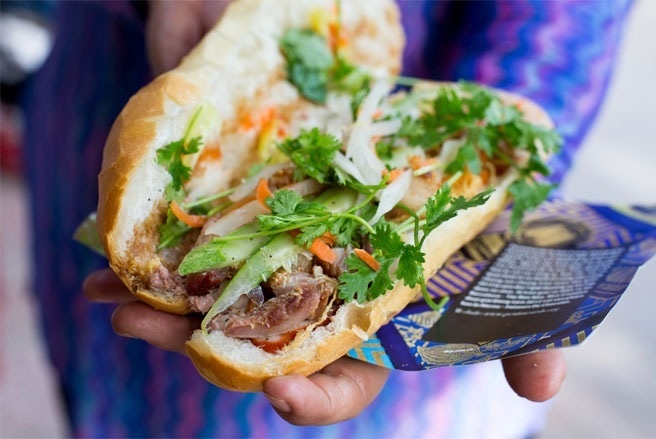 If you’re even the slightest bit into Vietnamese food, you’ve probably eaten numerous banh mi sandwiches. Along with pho, easily the most exported Vietnamese speciality is banh mi. Although banh mi can mean a variety of different things, and in Vietnamese it actually just means bread, sometimes the term can be used to refer to any type of the beautiful Vietnamese personal baguette sandwich. Walking around Saigon you’ll see dozens of carts with signs selling banh mi – it’s actually hard to go more than a block without seeing one – so it’s never hard to find. There are many different varieties of banh mi, and here’s a good resource for seeing the different types, but the basic sandwich starts with a crusty baguette that’s sliced in half (sometimes using a scissors) and stuffed with layers of pork, luncheon meats, shredded cured pork skin, pâté, mayonnaise, Vietnamese radish and carrot pickles, a handful of sliced cucumbers, sprigs of coriander (cilantro), and last but not least, an optional, yet in my opinion necessary, scoop of fresh pounded chilies. The sum of these ingredients together is what really makes banh mi such a glorious sandwich. Coming from Bangkok, where I can’t remember the last time I ate bread or a sandwich for that matter, I was pretty happy to devour as many banh mi as I could when I was in Vietnam. Here are the three main restaurants I ate banh mi when I was in Saigon. 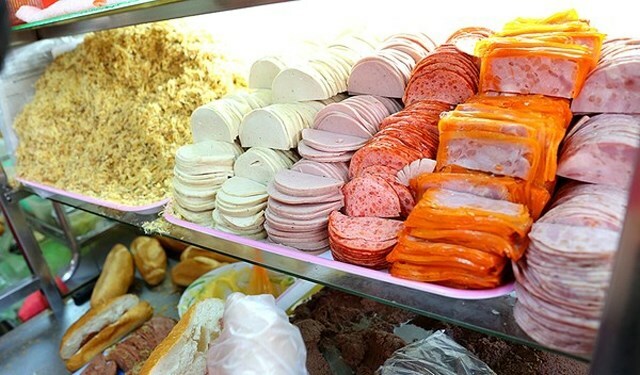 Mention banh mi in Saigon, and it won’t be long before someone brings up Bánh Mì Huỳnh Hoa (Banh Mi Huynh Hoa), what is easily the most famous place to eat banh mi pate in the city. During just about all business hours, Bánh Mì Huỳnh Hoa (Banh Mi Huynh Hoa) remains busy and hectic, and if you go in the evening, you’ll actually need to be on the aggressive side to place your order and get your sandwich. The banh mi was absolutely stuffed with multiple layers of different luncheon meats, pate, and mayonnaise, but there were less pickles, cucumber, and cilantro than on other versions I ate. So this is really a meat lovers dream come true. For myself, the sandwich at Bánh Mì Huỳnh Hoa (Banh Mi Huynh Hoa) was actually almost too heavy, and packed with too much fatty meat, but then again, I have to admit it was pretty tasty. I can sure see why it’s so famous, and if you’re a banh mi lover, this is a place you don’t want to miss. 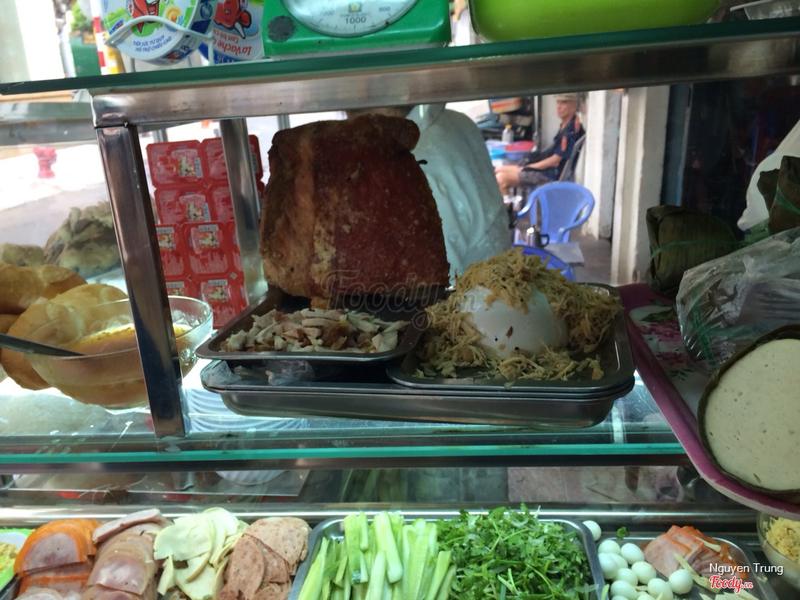 I was just walking around Saigon one morning when I stumbled into a restaurant called Bánh Mì Hồng Hoa. I noticed there were quite a few motorbikes rolling up, ordering sandwiches and fresh bread, and some motorbikes loading up big bags of baguettes. That was enough of a sign for me to need to eat there. I ordered just the standard bánh mì, a fresh and crusty baguette filled with slices of pork, luncheon meat, pate, mayonnaise, some nicely flavorful chilies, and a handful of freshly sliced cucumbers, and fragrant cilantro. What I especially loved about their version was that it was heavy on the herbs and fresh veggies. The family running the business was all very nice and helpful, and they were excited that I was eating there. It turned out to be one of my favorite banh mi sandwiches of my time in Saigon. Another banh mi favorite, located right in the heart of Saigon, and pretty popular with both locals in the neighborhood and tourists, is a stall that sets up in the late afternoon, known as Banh Mi 37 Nguyen Trai. They specialize in banh mi filled with little grilled minced pork sliders. 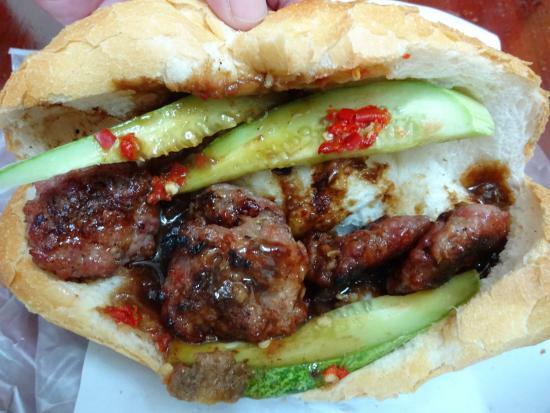 The pork was seasoned and freshly grilled, and when I ordered, the baguette was filled with grilled pork patties and lots of cucumbers and herbs, and sauce that was almost like teriyaki. Overall, very good, and if you’re in the area, it’s a definite must-stop to eat snack. A beautiful alternative to the banh mi sandwich is a Vietnamese dish called op la, or eggs cooked in a littler personal pan, often supplemented by slices of meat like ham, onions, and served with those wonderful crusty Vietnamese baguettes. Just like some other dishes on this blog, op la offers a bit of a fusion of Vietnamese and Western ingredients and cooking methods, all blended into a single meal. Although there are many variations of op la, to me what really makes it good is if the eggs are sunny side up, so the yolk is extra runny, and what makes it even better is if it’s served topped with caramelized onions and peppers. Banh mi op la makes a favorite breakfast for many locals in Saigon, and it most definitely hits the spot before a long day exploring the city. When I was in Saigon, one of the places I was really excited to eat at was Bánh Mì Hòa Mã, which a few of you recommended, saying I needed to try it. After doing a bit more research, I found out another great blog, Eating Asia had already written about this spot. It’s a popular breakfast place, and, although they had a few different things on their menu, their main dish is banh mi op la, fresh toasted baguettes with eggs fried in a personal pan. Just a few moments after I ordered, my flaming hot (you can literally hear the sizzle as it’s brought down the alley to your table) personal pan of fried eggs was rushed to my table, with an aroma that made my taste buds water immediately. I ordered two runny eggs, which were topped with a handful of assorted fried luncheon meats (they taste similar to SPAM), and a handful of caramelized onions and green peppers. Along with serving wonderful food, another great thing about eating here is the open air, side of the street dining atmosphere. The kitchen is located on the corner of the main Cao Thang road, but little plastic tables and chairs are set up along the quieter side of the alley, lined up in a row. Eating a delicious breakfast of banh mi op la, sitting next to the cool shaded wall, could hardly get any better for me. It was one of the best breakfasts I had.